Feature article covering my professional journey from home to NYC to DC, and my return to guest-direct Henry V for the Players Ring and perform in The Nina Variations. Feature article documenting my return visit from NYC to guest-direct A Lie of the Mind for Theatre on the Rocks at the Players’ Ring. 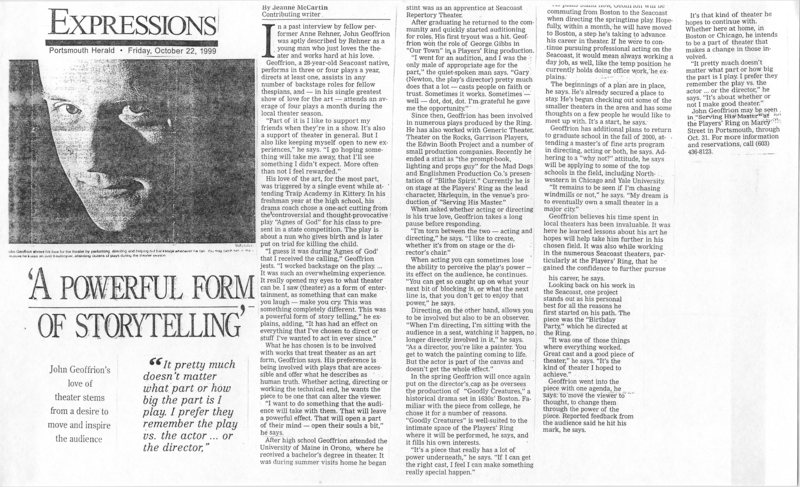 Feature article focusing on the opening of A Life In The Theatre, the premiere production of the Adequate Players. 1995 – Basher, a 10-minute short in which a gay-basher and his would-be victim make an unexpected connection. - ​Leadership of a non-union performing arts organization with a $50k annual budget. - In partnership with senior production team, planned full seasons of 3-4 productions per year in addition to special events and playreadings. - Gained attention for innovative Pay What You Can business model and commitment to stipends for all actors, crew and designers. Liaison between Executive Committee and various Subcommittees. Short and long-term strategizing for fostering relations and support between member organizations/artists, and advocacy for small, start-up, underground and “Fringe” theatre. Co-Chair, Volunteer Subcommittee - Organized and coordinated volunteers for 2012 TCG Conference in Boston. The banner under which I self-produced various theatrical productions from 1994 - 2010. Invited to participate in readings of Now I Ask You by Eugene O’Neill and Ibsen’s Hedda Gabler, plus Meisner workshops. Part of a stable of directors presenting scenes and plays in-house for peer-review as well as for potential future public productions. Directed Steven Deitz’s The Nina Variations, presented in-house in April 2004 and performed in May. Assisted with creation and production of a regular playreading series that began readings in May 2004. Acted, directed, produced or otherwise assisted on over two dozen productions, produced either by the Players’ Ring itself or by numerous resident companies. Most recently produced, directed, and text-edited a modern dress production of Henry V, and acted/directed an acclaimed staging of Steven Dietz’s The Nina Variations. Portsmouth, NH based non-professional theatre company. Acted, directed, produced or otherwise contributed to numerous productions, assisted in readings and play selection. Returned in 2003 to direct Shepard’s “A Lie of the Mind,” which received two Spotlight Award nominations. Portsmouth, NH based non-profit theatre collective. Acted, directed, or otherwise contributed to numerous productions. Co-organized and participated in regular playreading series. Served as company secretary.